If you commute to Takapuna from the city centre or inner suburbs, I highly recommend that you consider taking the bike. On a good day, I can make it to work in 40-45 minutes, which is competitive with cars and faster than the bus. (Getting back’s a bit harder as I have to go uphill, but I can still do it in 50-55 minutes.) 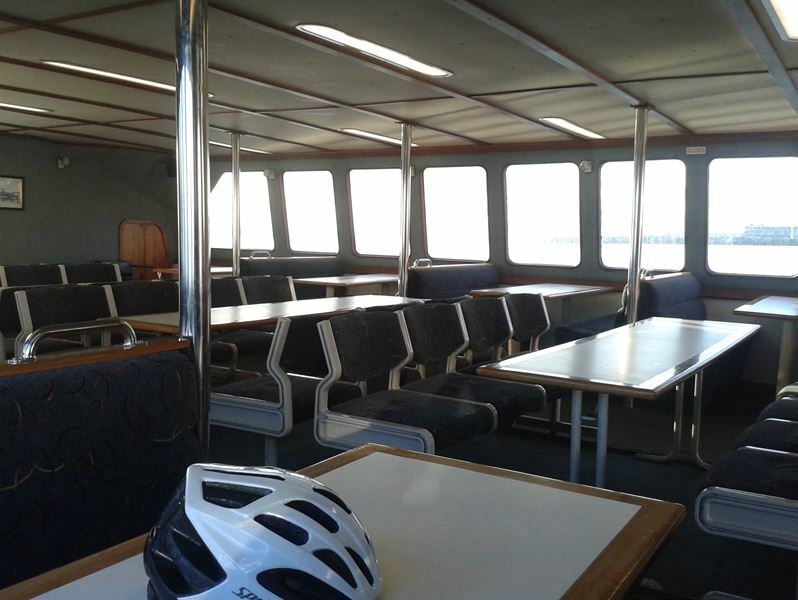 You get to ride on a completely uncrowded ferry, which seems to be a rare experience in Auckland these days. Cycling on the shore side is very safe, as Bayswater Avenue doesn’t get a lot of cars, and the shared path gets none. And it’s a really beautiful ride to boot. 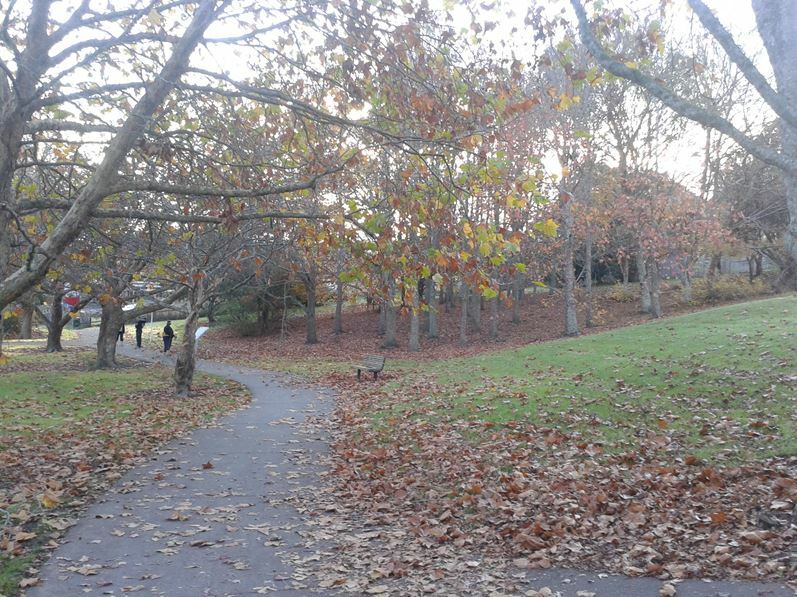 Probably one of the best cycle commutes in Auckland. And now, for the Tour de Bayswater by cameraphone. Here’s the view from the Bayswater Ferry back to the city centre on a sunny morning. The ferry runs every half-hour during the peak periods, and hourly during the middle of the day (see the pdf timetable). I was running a bit late on the morning I took these pictures, so I cycled like mad down Symonds St only to have to wait on the wharf as the ferry emptied out. The ferry is always completely full with commuters when it arrives in town at 8:20 – but I’m usually the only person to get on in the other direction. That is an insanely unbalanced peak flow! The bike racks are completely full on the Bayswater side – in fact, they seem to be fuller than the expansive park-and-ride. 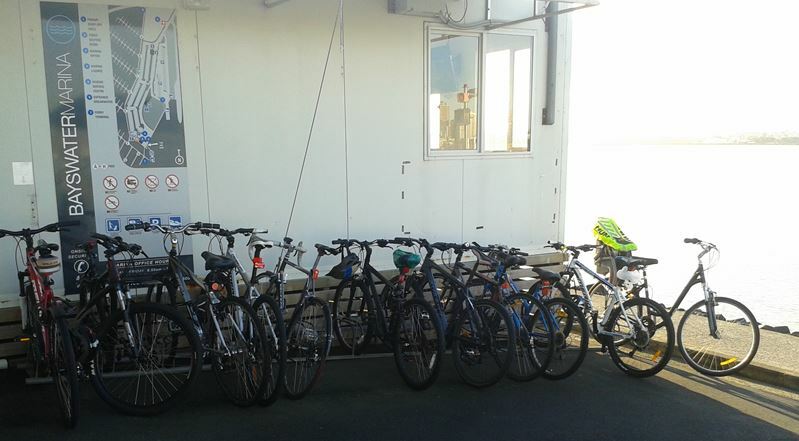 Auckland Transport seems to recognise that a lot of cyclists use the ferry. A few weeks ago I got a quick bike tune-up and hot chocolate at a winter pit-stop sponsored by AT and Bikewise. Then it’s up a small hill and onto Bayswater Avenue, which is dead quiet at this hour. Many of the kids at the local Belmont Primary cycle or walk to school, which cuts down the traffic quite a bit. I usually only see three or four cars. And then it’s off the road and onto the shared path down the side of O’Neill’s Cemetery. At 8:40 in the morning, it’s generally populated by dog-walkers, who sometimes need a bit of notice of approaching cyclists. The new pipeline bridge is fantastic. You feel like you’re gliding over the mangrove flats, which can be a pretty extraordinary sight on a good morning. It’s also a perfect demonstration of how good cycling infrastructure can make biking easier by linking up areas that are hard to move between by car. It adds a direct connection between two of the little finger peninsulas on the shore. The shared path wends its way around the bays before terminating at Francis Street. From there, it’s an uphill cycle to Jutland Road, another low-traffic side street. The intersection of Jutland Road and Lake Road isn’t fantastic. The curb bulbs out just before the intersection, forcing cyclists to squeeze between the cars while making the turn. 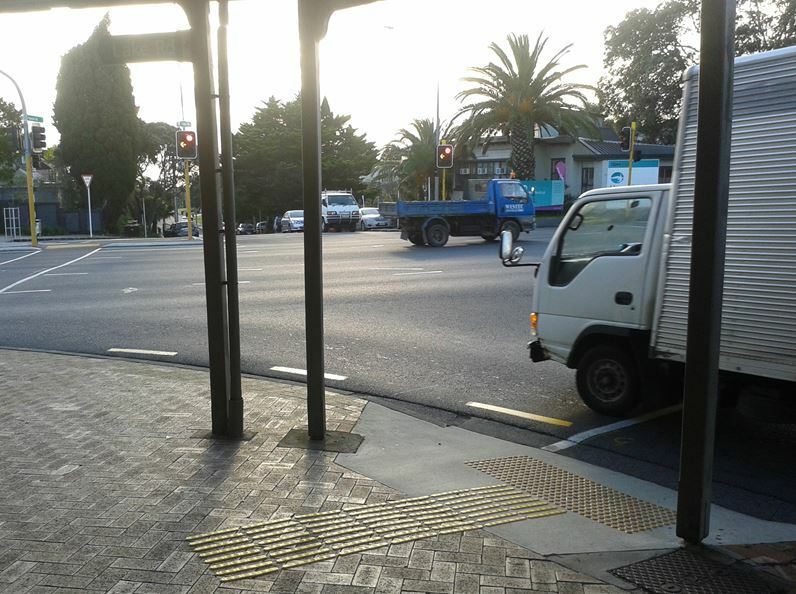 Frustratingly, this intersection leads to the painted cycle lanes on Lake Road. For safety’s sake, I usually hop up onto the sidewalk around this intersection. This isn’t an option on the trip back, so I usually do a hook turn using the pedestrian crossing button. I have to wonder what AT was thinking when they built such a terrible intersection between two of the major bits of cycle infrastructure on the shore. Jutland Rd / Lake Rd intersection 1: Where’s the space for cyclists? Jutland Rd / Lake Rd intersection 2: Still not seeing any space for cyclists. 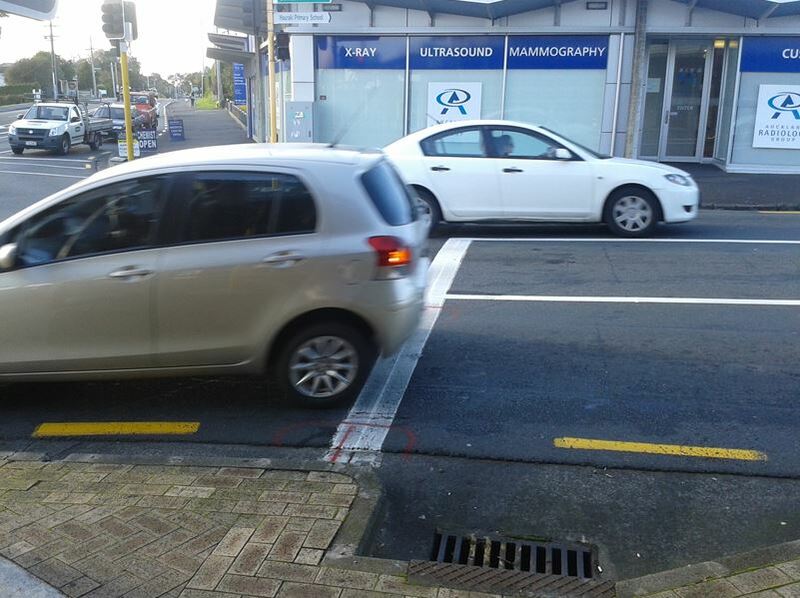 Jutland Rd / Lake Rd intersection 3: The painted cycle lane appears, at long last, in the left corner of this photo. 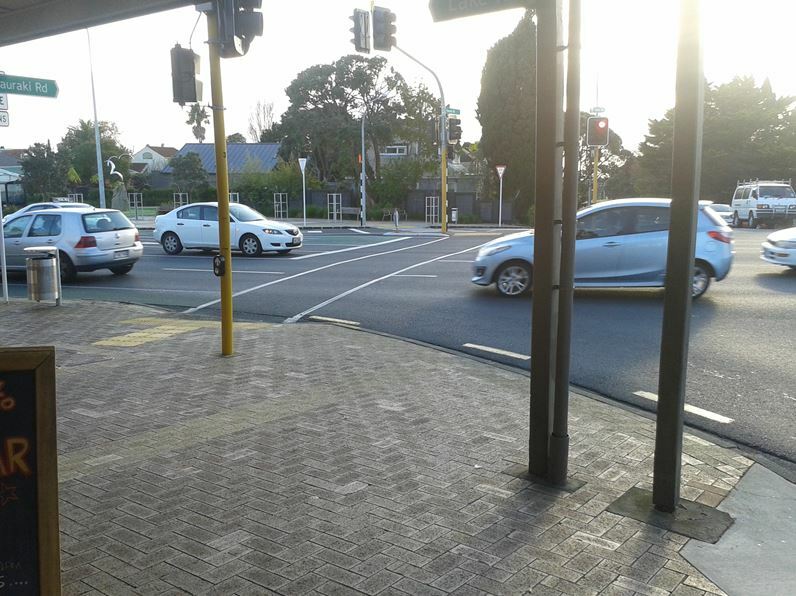 Moreover, the painted cycle lanes on Lake Road end in a dangerous way at the intersection with Esmonde Road. 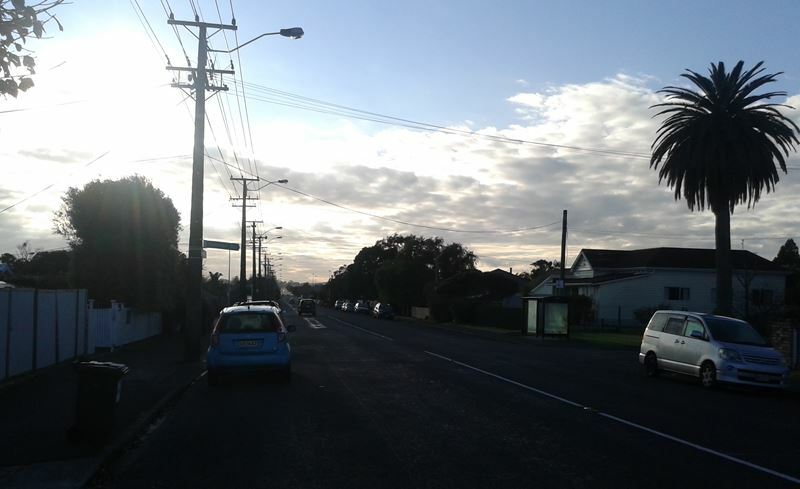 Rather than continuing along Lake Road to Takapuna, they take a left and go part of the way down Esmonde Road (i.e. towards the motorway interchange) before vanishing entirely. There’s no obvious, direct way for cyclists to continue through the intersection, which forces me to merge across a lane of left-turning traffic. Fortunately, traffic speeds slow down a bit north of the intersection, which means that the last bit of the ride is civil. That looks like a fantastic way to start and end the day. Lucky you! This is very similar to my multi-modal commute too! I’ve been at it for two years now – I started with the cycle / Bayswater ferry / cycle trip as illustrated here (although I braved the traffic on Lake Road as it was a quicker/more direct/flatter route), but soon changed to a cycle/bus route for a number of reasons – namely, the frequency of buses to Takapuna (I kept missing the ferry), the lower price of a HOP fare vs the ferry, and, as I am coming from the west, its about 1km less cycling on the City side of the harbour. Its unfortunate I have to leave my bike locked up outside all day and not have it with me at work for lunchtime errands… bring on the Skypath! That is a great commute! But I give you one summer working in Takapuna before you end up completely seduced by the North Shore. 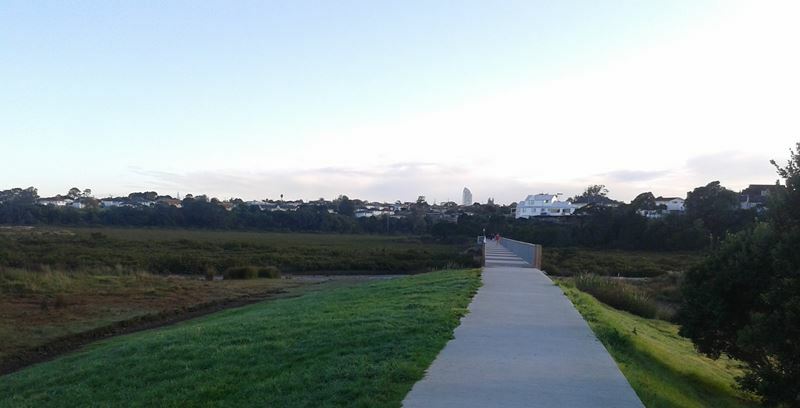 I used to cycled this same route back aounr 2005, but with the addition of Downtown to Onehunga. The downtown to Takapuna part was a highlight for sure and I highly recommend it, especially that off road bit through the graveyard and across the mangroves. Through if the skypath was in I would definitely consider. Yes, some great routes to ride, walk and run in that area. The Northboro pipe bridge is great, but of course its not new. It’s been around for many years although it has recently been improved and substantially widened. It’s interesting that you say “Even without the skypath”, because I suspect that even if the skypath happens, you would still use the route described here. Unless at some point in the future there is going to be a nice cycleway alongside Shoal Bay and up to Esmonde road, using the skypath would force you to follow a less direct route on a bunch of uninspiring roads up through Northcote. Not nearly as pleasant as the route you’ve described here. 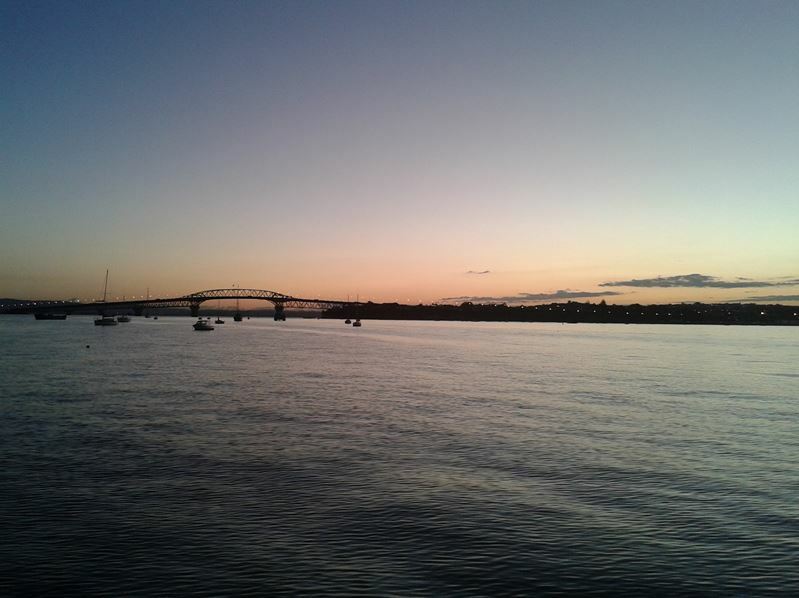 Admittedly, that’s true – the Bayswater ferry gives a much more direct connection. 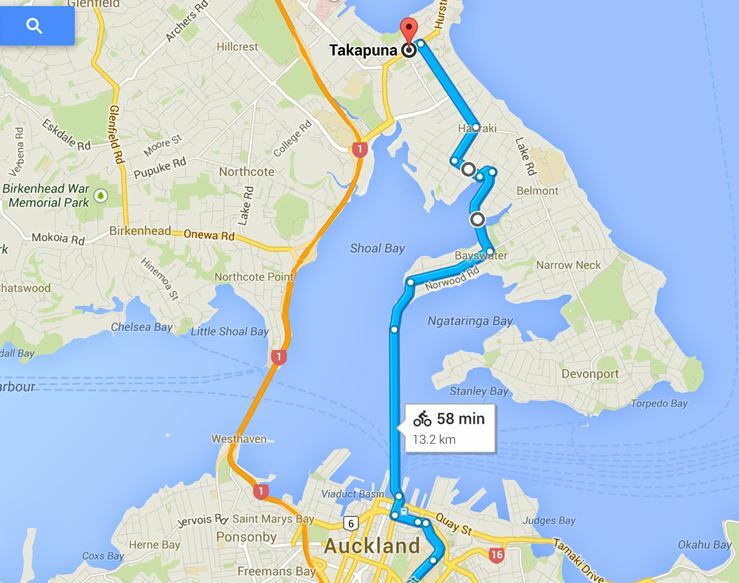 Once you figure out the ferries, it’s pleasantly easy to cycle to and from the Devonport and Takapuna areas. What the Skypath’s going to do, hopefully, is open up similar options for people in Northcote and Birkenhead. 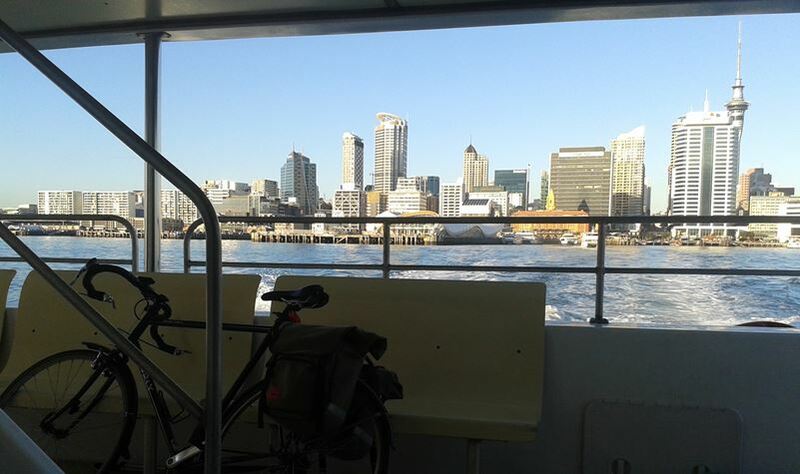 I normally cycle from St Johns to Takapuna once a week or so, catching the first ferry (05:45) from Downtown to Devonport. There’s usually one or two other passengers on the first ferry, but one or two dozen heading to the city on the return trip at 6:15. 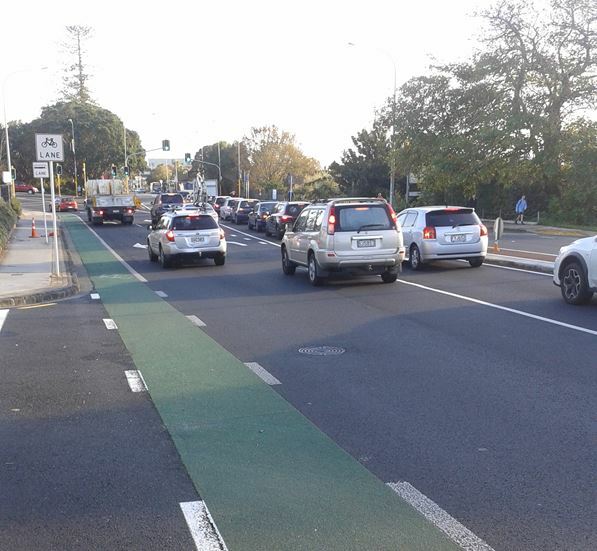 Cycle lanes all the along Lake road are great – but that final stretch into Takapuna where the cycle lane vanishes around Esmonde road is a major pain – even in the early hours. Never helped by vehicles trying to cut ahead in the outside lane just so they can get round the corner first. Look at all those parked bicycles! I wonder what the Birkenhead Ferry Terminal is doing wrong? When I was in Auckland over the summer I noticed the newly constructed secure cycle parking facility was woefully under utilised. I saw a maximum of 2 bikes parked there, but most days it was empty I thought it would be attractive for Beachhaven, Glenfield and Chatswood based commuters. Is it just the lack of any cycle paths in these areas? Quite a few commuters arrived by bike but they seemed to always take their bicycle across the harbour. Need to keep it simple. Those cages require registration and complex codes. On the other hand the Bayswater one seems like keeping it simple, under cover and good visual surveillance. Maybe once have decent amount of easy parking, then can add complicated parking that requires registration. My mom’s family’s from the shore, so I’ve had years of opportunities to be seduced by the place. Still hasn’t happened! If only the Lake Road cycle lane actually made it to destinations like Takapuna, Akoranga bus station and Devonport Ferry. Typical of cycle infrastructure that when the route gets tough, the cycle lane disappears, usually leaving its as an island. To be honest (and I may be wrong as a non-cyclist), it sounds like one of those quick wins you described at the AT Board meeting yesterday afternoon. That’s exactly why I included a few brickbats in with the bouquets. 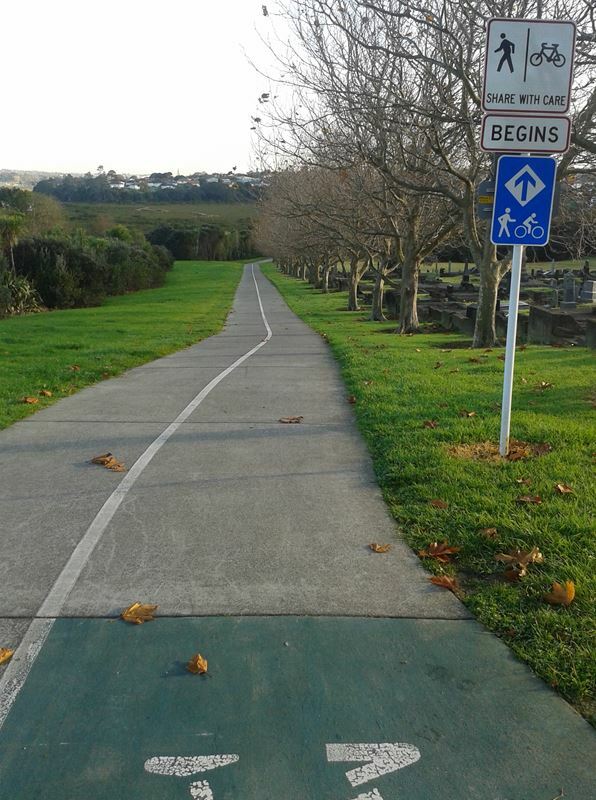 This is, by Auckland standards, a really high-quality cycle route. Good PT connectivity, low-traffic streets and a great shared path. But it’s let down, right at the end, by lazy thinking about how to connect together cycling routes with each other and with destinations. The things that I’ve highlighted don’t necessarily require big changes, but they do require you to spend a bit of time on the bike seeing what works and what doesn’t. Get on the bike, AT! Excellent post thanks. I start a city-Nth Shore Hospital commute in July. Will be interesting to see how it goes! Anyone else got good / lesser known cycle commutes to share? I thoroughly endorse this idea! Jutland Road has been nightmare for cycling since I was at Primary School in the area! Random question. Why didn’t a ferry go closer to Taka puna? It looks like there’s a much closer inlet. …. Take a look at the satellite images on google maps and you’ll see. It’s a shallow bay once you get past bayswater with much of it out of the water at low tide. How things change.! A small gaggle of bikes are referred to as many bikes……..In 1959 when the bridge opened I lived in Bayswater and in those days there were bikes chained up to the rail on the side of the wharf for its entire length in their hundreds and the same at the other terminals. Sadly for that part of the Shore the bridge stopped the ferry and we had to bus to the Devonport ferry, to keep that one viable until under sufferance our bus was re routed via the bridge. This cost us more and either way took us three times longer than the direct ferry. Ah well that’s progress I suppose. Oh and there was a 2/6d toll each way driving over the bridge too, about $4 – $5 in today’s money. This isn’t new, the Dutch have done it for decades. Sorry about that. My apologies. The Lake Rd bike lanes are under constant attack in the local Devonport newspaper (see https://dl.dropboxusercontent.com/u/35550953/CycleLanes.png). Many people want them removed because they’re blamed for the congestion on Lake Rd. The latest angle is they should be replaced by bus lanes and the cyclist relegated to the back streets as they will be on Dominion Rd. By the way if you have any suggestions for cycling improvements in Devonport / Takapuna please let me know at [email protected]. We’re working with the local board to do develop a list quick and cheap fixes we could do Janette Sadik-Kahn style. Excellent article. Bayswater is such a cycle friendly peninsula. I live in Norwood Road in Bayswater and most mornings around 6am you hear the fast “swissshhh” of a group of riders, sometimes up to 30 strong including school kids, out training – doing the Bayswater Ave/Norwood Road circuit. Hardly a car in sight – safe as.